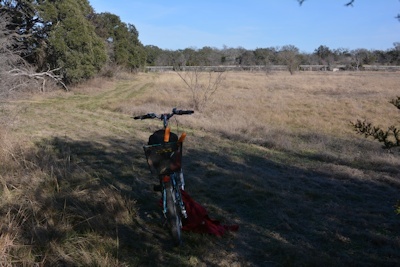 Today--in mild temperatures and under a sunny sky, I finally cleared enough chores to go out and work while the weather made that possible and the ground was firm enough (barely) to ride the bike out. I needed to work on the east trail in the dry woods. 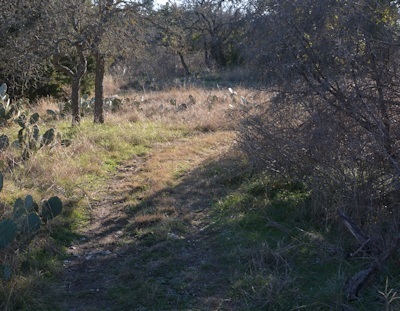 It enters the dry woods on the east side, near the north fence, and angles away from the fence until it meets the Fox Pavilion trail (entering the dry woods on the south side and emerging from it at the north fenceline on the west side. First I rode up to Fox and refilled the wildlife waterer there. Then I rode back down to the berm the east trail starts on, and headed east. Very soon I had my first pruning to do. Branches of a cedar elm--some alive but leafless in winter, and some dead, hung too low over the trail for either a walker or a bike rider. So I parked the bike and cut them away as high as I could reach. The low cactus right beside the trail (close to the juniper) is hard to see at this size, but will need to be pruned back or (more likely) dug out, as it's at ankle-catching height. 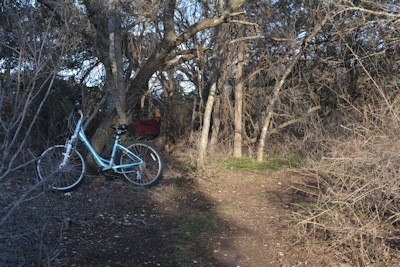 At the end of the straight stretch ahead, a live oak tree blocks more travel on the berm, so the trail dips off the berm to the right, then makes a sharp turn left around the tree and the dead juniper right beside it. In between were a few other limbs to trim back (not seen here) but I didn't stop for pictures there. 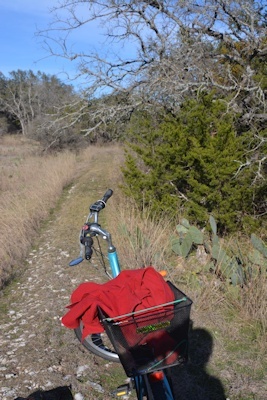 When I rode down off the berm and around the live oak, I got a big surprise--the elbow bush had grown out in the trail so far that I had to bull through it or risk falling into a large stand of cactus. 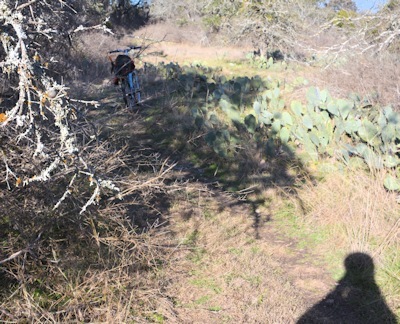 That one cactus is still inconveniently close to the side of the trail, and likely to grow out into it. So a session with pickaxe and shovel is called for, plus the heaviest gloves. 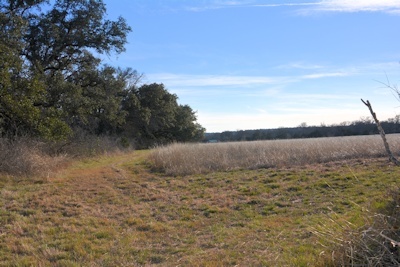 This corner often has a fine carpet of bluebonnets in spring. Those big live oaks hanging their limbs down have their trunks on the other side of the fence, alas. They belong to our neighbor to the north. Like anyone who owns land, I have a touch of "Landowner's Disease" which leads to wanting not all the land, just the land adjoining mine. It's rented out, with no one living in the house there. Sad. There was a little fruit orchard (now dead) when we moved here, and a good kitchen garden and so on. All gone. I took this picture sitting in a chair facing away from the sun, twisting around, and it's not quite level--tilted a little to the left. But it shows the line of trees on the west side of the dry woods. Many died in the drought, but some survived, in the deeper pockets of soil. 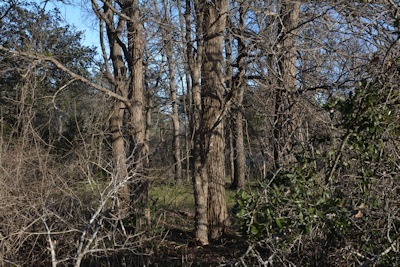 Facing into the dry woods, here's a group of cedar elms, with a very young live oak (the green leaves to the right) and more small scrubby live oaks seen beyond the thicket. The understory here is elbowbush; elsewhere it may be Mexican persimmon, elbow bush, bumelia. In between the elms, all down this stretch, are little grassy lawns. Deer like to rest in them, and they browse elbowbush. I used to have a trail there, until an experience with Mr. Buzzy, a very large* rattlesnake, which coiledup and made it very clear he had no use for humans in one of his favorite spots. So I venture into the trees here only in winter, when he and his relatives are safely underground somewhere, and haven't tried to keep the trail open. *All rattlesnakes look very large when they're coiled up and buzzing at you. Mr. Buzzy certainly had an impressive set of rattles and made an impressive stack of coils, but I am easily impressed by rattlers....into going somewhere else. When I'd rested and had some water and a piece of bread--and the Northern Harrier who sometimes hunts the west grass, floating along just above the grass looking for cotton rats had not appeared--I went back to the bike and rode back through the dry woods, turning west as I came out to take the more western trail back to the house. 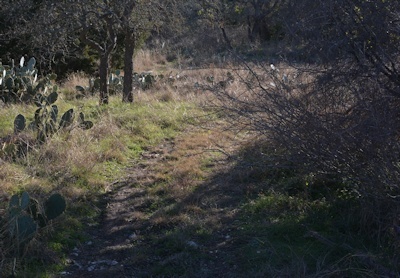 That involves an interesting dive into an old ditch and cow path, then up into the near meadow and along the north horse lot fence back to the gate into the barn lots and house yard. The trail from the view corner back through the dry woods curves sharp right here--though it doesn't look like it, that elbow bush has been pruned back--then twists, turns, and heads sort of south up to Fox Pavilion (which is on a rise) then down, across the berm, sharp left onto Cactus Flat, sharp right again,and various turns through the lower dry woods out into the south grass. Now that the branches aren't grabbing my legs or the wheels, or scratching arms or helmet, it's a lot of fun to ride. I definitely understand the feeling to want to own the land just on the other side of the fence, or in some cases we don't even have a fence. You know you could manage it better, right? And it would round off your place so well...THEN you could do (some project you've thought of which just happens to require that bit right *there*--you can see clearly how it would fit in and round off and make everything perfect. Decades ago I ran across some books by an early 20th c. writer whose pen name was David Grayson, and in one of them, he described Landowner's Disease so vividly, so accurately, that when I finally got some land and caught the bug, I knew instantly what it was. Not ordinary daydreams or ambition (as owning a bit of land was before I had any) but a particular kind of inherently unlimited greed. Grayson was (still is, actually) one of my favorite "homespun philosopher" writers. Definitely. We're still building our house, so things are moving slowly. Once I'm out there full time, we'll have plenty to do. It really is beautiful out there. I have a lot to learn about the land, especially in identifying the various trees. I also need to do research to see what effects wireless might have on wildlife. The point to point link we're doing to feed Internet out there won't be a big deal, but I may not want to do a wide area omni for access in the woods if it will cause issues for the birds and other wildlife. Aside from the cat liking to sit on surge protectors because they're a little warm...our wireless router puts out a signal reaching outside the house and it has not seemed to have any effect on birds here (which I've been watching since long before we got it.) Same species, same behaviors. The difference in numbers during migrations is clearly attributable to changes in climate, local weather, and breeding success away from here. The birds that breed here in summer are producing the same number (some variation year to year as trees mature and give them different habitats) of fledglings. I'm not saying there's no effect, but that any effect is subsumed in the greater effect of climate change on local weather--the timing of first & late frost, for example, the non-match of migrations to the time plants break bud, leaf, and flower, of insect hatch to songbird migration or nesting. Because our place it long and skinny, and I know how far from the house the wireless will connect a tablet (for instance) I know that a lot of it isn't affected by our wireless (and the tablet or laptop won't see a signal there either.) But the whole place is affected by rainfall, temperature, wind, and so on. Maybe your place will be the same. The main thing I read was that the cell towers as well as other wireless we've deployed is effecting the bee populations as well as some birds and humans. A lot of it has to do with the power being sent out. A home wifi router usually doesn't put out a lot. If I did an outside one, the power would be much higher and it could have an effect. sub-300 meters is a very dangerous distance for cell towers. We are looking at doing a point to point (size of a pencil is the wireless path) to get to our property and then we'll dig in some fiber to the house. We won't be able to play on tablets out in the woods, but I'm fine with that rather than risk the eagles that call our property home; and especially the bees. There are still ongoing health concerns about the new cell phones we use and what the overall effect it will have on us. The largest issue seems to be that it is an additional stressor which combines with the rest of the stressors on our bodies. The whitepaper I read mentioned issues that can lead to genetic mutation and carried down to our descendants. I'm going to laugh if in 20 years they determine that cell phones were more damaging than cigarettes ever were. South of us is a field still being overgrazed, with an untreated gully (an extension of the drainage from the highway across ours, with a spot for a very useful stock tank, plus erosion management on the banks, if I were allowed. Across the drought-dried creek, another field that was also overgrazed, now growing up in non-native less nutritious weeds. I could do something with that, too, hiring someone(since I'm now getting too old, and spending too many hours writing books, to shred that much myself) to mow the undesirable vegetation down, sow the tough native grasses and keep the forbs short enough the grasses can survive and eventually take over. West of us...there's a not-well-managed pasture with a tributary of the creek that could use better erosion management on it. North of us--erosion off those fields dumps their topsoil onto our place where--in big rains--it helps rip up some of the grass (though not as much as before) and adds to flash-flooding in the creek proper. Checkdams there, and across the paved road north of it, would do a lot to make the fields more absorbent, the grass there have better coverage, etc, etc. Part of my desire to act is because I know the landowner won't. The previous owner tried to get permission to develop the field three times and failed because the access is so poor, it's bounded by railways, a canal and with houses. It was sold in a parcel with a bungalow and a plot that did have a house on it with a provision that the new owners had to give the old owners 50% of the value of any profit they made from improving the sites for ten years. The new owners have no intention of sharing any profit so they are renting out the bungalow and doing nothing else for now. From what I can gather they aren't interested in the field at all, which is worthless, but the bungalow and the site of the old house are a different matter. Planning is tight here, but you are far more likely to get permission if you build entirely within the footprint of an old building and they could make a good profit doing that on both plots. Thank you for sharing. I'm enjoying your reports tremendously. It is good to see the land loved. Drought and all, it's responded to the care and looks a lot better than it did 15 years ago. For one thing, it can respond to a hard one-inch rain by holding it, absorbing it, not sending a lot of soil downslope.